This is the moment a terrified chihuahua was found trapped 10ft underground in a manhole by a concerned passer-by. The one-year-old pooch was rescued by a tradesman who heard the canine’s terrified barks in the woods near Kansas City, Missouri, USA, on Sunday afternoon. With the help of staff from a nearby pet shelter, Robert Guymon, 28, crawled into the manhole and lifted the pup to safety. 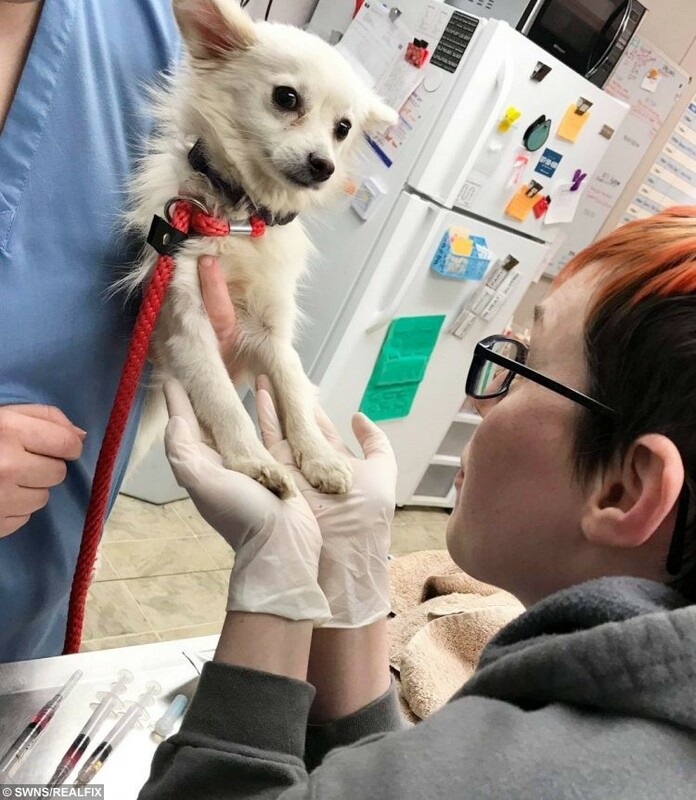 The chihuahua was nursed back to health at KC Pet Project where staff nicknamed her ‘Baby Jessica’, after Jessica McClure, the 18-month-old baby who was famously found in a well in her aunt’s backyard in Texas in 1987. The adorable hound already has an owner lined up to adopt her once she is in full health. Robert, a concrete finisher from Independence, Missouri, was shed-hunting, a popular pass time where people scour woods for fallen deer antlers, when he heard petrified howls. He followed the sounds to a manhole, looked down and saw the emaciated chihuahua shivering in the darkness. He said: “I heard barking and followed it straight to a manhole. “I looked down and saw the dog. “I had no idea how long she had been down there or whether she was injured. Robert hurried to nearby KC Pet Project and asked for assistance. The manager returned to the manhole with him and the pair crawled down to lift the pet to safety. He said: “She crawled down in with me. “The chihuahua was terrified and kept squirming in our arms. “We had to get her wrapped up in a blanket but she was definitely fighting it. 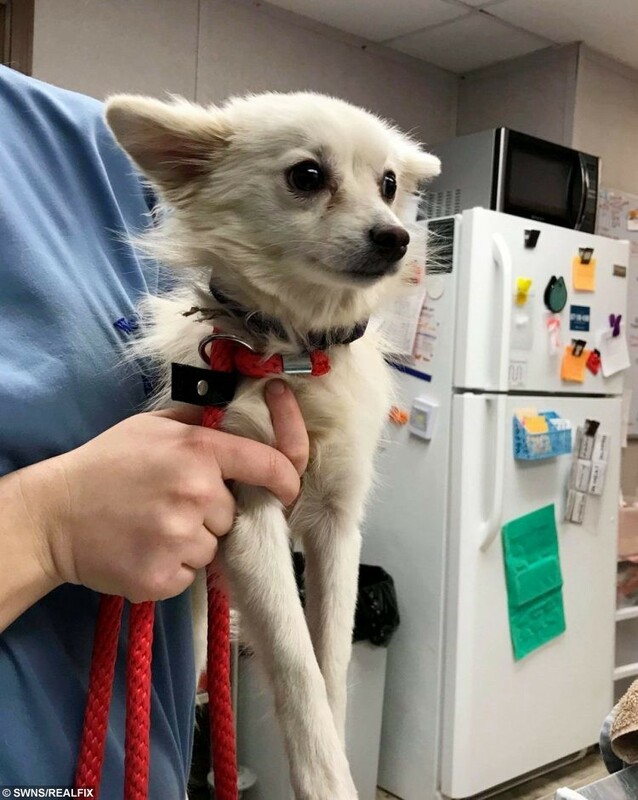 Staff at the shelter were amazed to discover that despite being found ten feet underground, the chihuahua had no broken bones. She was more than four pounds underweight and at first didn’t want to be touched. Tori Fugate, the shelter’s director of communications, said: “She was very scared. “She didn’t want anyone handling her. “But as soon as we opened up a can of dog food, she was all over it. “She was suddenly affectionate, giving us all licks and love. “There was hardly an ounce of body fat on her. “She weighed almost five pounds when she arrived. “She should weigh around eight pounds at a healthy weight. “But apart from that she was incredibly healthy with no broken bones. “She didn’t have a collar on and no identification. The pooch quickly earned the nickname Baby Jessica and already has a loving owner waiting. Tori added that if Robert hadn’t found the chihuahua when he did, she would almost certainly have perished in the upcoming arctic freeze. She said: “We have to keep animals for five days to allow their owners to come forward but we do allow people to put early bird hold deposits on dogs that have come in. “Someone has already put a hold on her so she has a loving home to go to. “She is precious. She is so cute and loving. She is going to make a great pup for somebody. “We don’t have a name for her yet as we’ll leave that to her new owners. “But her nickname was Baby Jessica, after the famous story of the baby who was found in a well. “We’re so happy that this man stumbled upon her. “The woods are deserted and he just happened to be there to hear the barking. “We are expecting -20 degree temperatures and she would not have made it if she had been left out there.